Being organized is my jam and makes me oh so happy. I love it when everything is organized. I created a Teacher Binder to help me stay organized at school. I LOVE it! I can just grab my binder and find what I need. I don’t have to find this paper or that list. It is all in one place. I take it home every night just in case I need/ want to work on something for school. First, pick if you want to use a regular 3 ring binder or Happy Planner rings. These are the big Happy Planner rings (you need a box of 11 rings) but if you want a thinner binder use the smaller Happy planner rings (you may need to buy 2 boxes so you have 11 rings). Next, print the pages/forms you need, print the dividers and covers you need. Get your binder and put it all in! Now you can start the year organized. 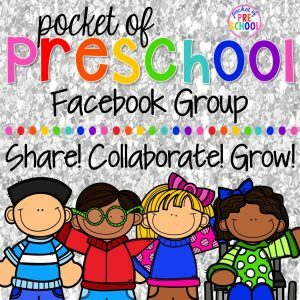 You will find TONS different organizational pages! To help with lesson planning I included a page for weekly lesson plans, centers plan, group plans, unit sketch, a year at a glance, and a reflection page. Keep track of student information using class lists, student birthdays chart, basic information pages, student services at a glance, and student interventions. Organize all of your teacher resources using a professional development log, sick & personal days off log, usernames & passwords chart, favorite websites list, and book wish list (my favorite). With everything you have to do, I created tons of different “To Do” lists. And I couldn’t forget about all the meetings we have so you can use the notes, class notes, and meeting notes page. The pages and forms are now EDITABLE (PowerPoint file) and just print (PDF file). Just print and write directly on the pages or type your lesson plans, print, and put them in your binder! This is perfect for those of you who have to turn in your lesson plans each week. What is editable are the colorful binder spine labels, tabs, and covers/dividers pages (make sure you open the file in PowerPoint to edit). If you are anything like me, you LOVE having things that match! Pick the pages that match your classroom décor! The binder spines and matching covers/divider are also in a PDF. Super simple, just print the ones you need! You also get a monthly calendar for this school year. THE CALENDAR IS EDITABLE! Each year, I will update the calendar! All you need to do is go to “My Purchases” section on the TPT website and download the newest version for free (along with any additional pages I add to this product)! Think about how you want your lesson plan format (subjects across the top or the side). These pages are editable so type in your schedule and print double-sided. On the other side of the Monday page (left side) is my center planning page and on the other side of the Friday page (right) is my reflections and notes page. You could also put your small group or RTI page on the back instead. 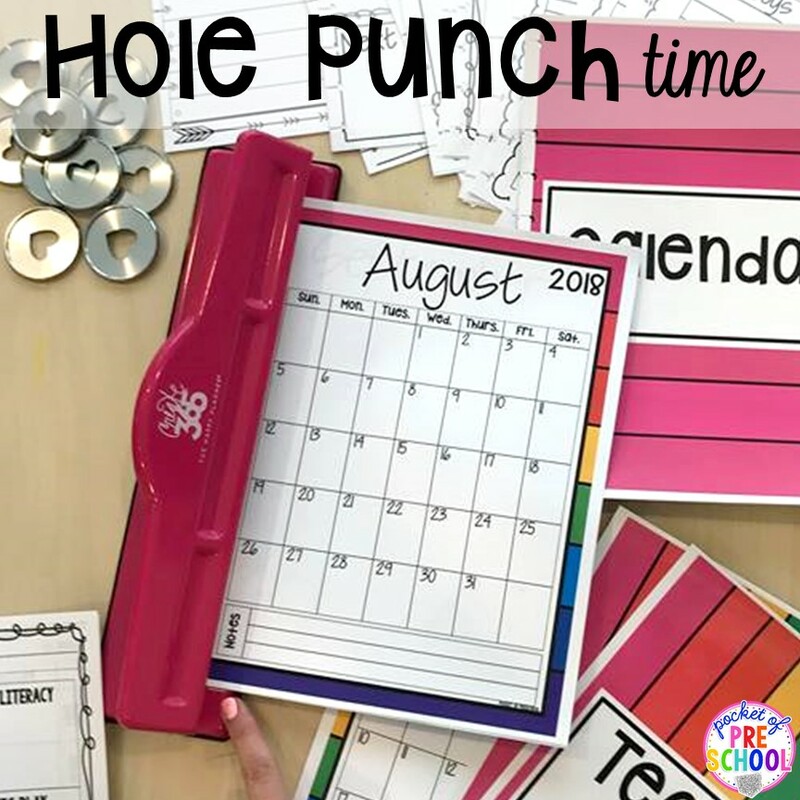 If you are using Happy Planner Rings you will need the PINK Happy Planner punch and if you are using a 3 ring binder use a regular 3 hole punch. Make sure you line up the pages so the holes are in the right spot. 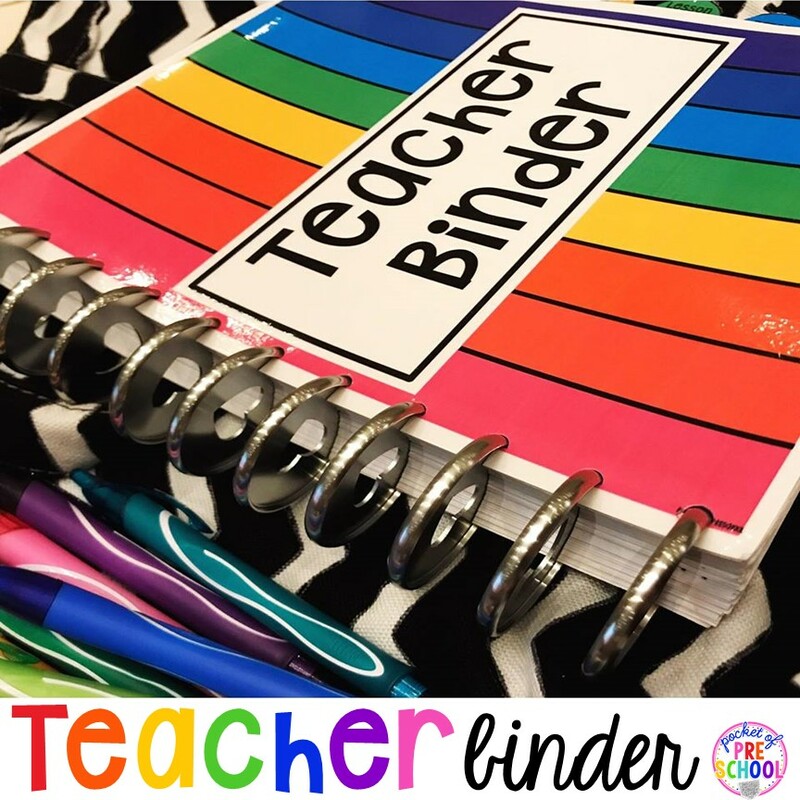 QUICK TIP >> Assessmemble the binder and flip through it to make sure it opens like you want it BEFORE you hole punch it to make sure you are hole punching the right side. For example, the back cover will be hole punched on the opposite side. The other thing I put in my Teacher Binder is my year long curriculum map! 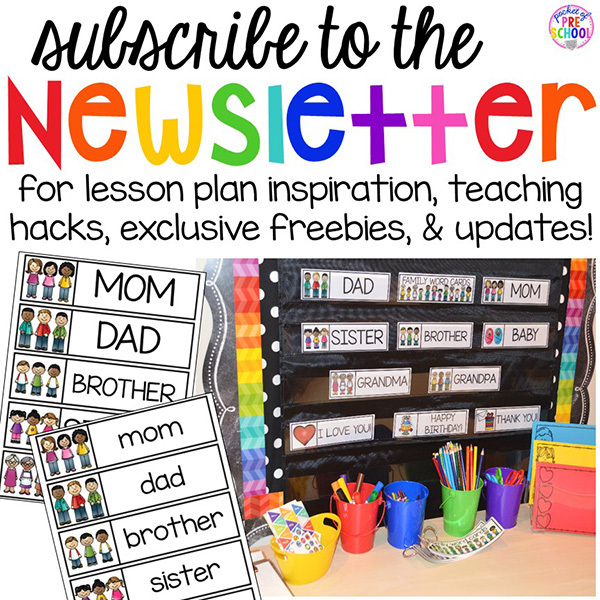 It includes 2 week themes for the WHOLE year (summer too), sensory table ideas, STEM challenges, a book list for each theme, and MORE! It has saved me so much time. Grab it HERE for FREE! Need help printing multiple pages to a page? Watch this video HERE. I did a whole FB live on my Teacher Binder! Watch it below. Love this teacher binder? Pin this image!